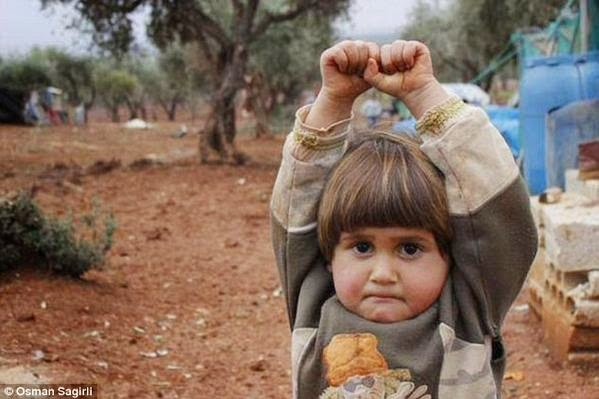 If you missed this viral photo, this adorable Syrian girl broke hearts around the world when a photographer took this photo of her with her hands raised in surrender . Four year old Hudea stumbled into photographer Osman Sagirli in Atmeh refugee camp ,mistaking his camera for a gun,she raised her hands up in surrender.. According to a new report by Mailonline, she is now in the clutches of Al Qaeda.She, her mother and three siblings are understood to have been living in the Syrian camp since Hudea's father was killed in the 2012 Hama massacre. But two weeks ago, the family took a fateful decision to move south, towards the city of Idlib - only for it to fall into the hands of Al Qaeda's brutal Syrian affiliate at the weekend. It means, once more, the family are in danger of becoming victims of a battle between the regime and rebels which has killed 220,000 since 2011 - 10,000 of whom were children.